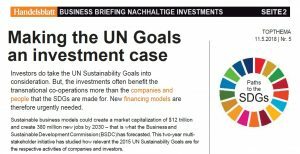 When Basel Institute of Commons applied for the UN SDG Partnership in late 2015, there was enthusiasm among the new stakeholders from Civil Society and Academia: will we all become a part of joint efforts to achieving the 17 Goals? Will we be SDG fellows and sustainability buddies? The first setback came in early 2016 when some Statistical Offices reclaimed our inclusion in the IAEG on the SDGs. As a consequence, the civil participation has been stopped. Since then only the Statistical Offices are allowed to define and discuss the indicators measuring the SDGs. While we are among a small group of experts worldwide that have stakes and overview on measuring the SDGs – maybe twenty persons worldwide – neither IGOs nor NGOs consider the issues on measuring the SDGs. In general they select their favorite SDGs – those who fit with their agenda – and leave the measurement to the National Statistics Offices. Now, in March 2019, the situation entirely changed. 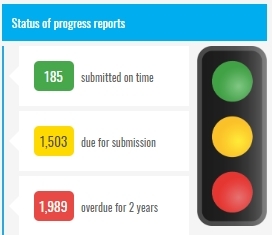 From 3677 projects within the UN SDG Partnerships, only 185 are in line and achieved the green „SMART“ button (see screenshot). If you’d have a look at the other projects, you quickly see that they are all regional and/or national. It may though occur that the World Social Capital Monitor remains the last Global SDGs Partnership project. We won’t hope that and encourage other projects to continue to supporting the 17 SDGs – even without donors, who cherry pick the SDGs and never go for worldwide visions fearing to be blamed while missing them. Since Crimea returned to Russia, NATO – driven by the United States – is imposing ongoing threats on Russia. While few European leaders keep good relations with Russia (reducing it on the person of ‚Putin‘) – sanctions and boycotts damage not only Russia but at first Ukraine and neighboring countries such as the Balkans, the Baltic, Bulgaria, Poland, Romania and Greece. The damage of the NATO politics is at around € 400bn per year only in trade. If we include the damage caused by the military expenditures of the NATO countries we may easily reach € 1.5 trillion per year. This is almost collateral damage in times where countries have to collaborate to address Climate Change and Poverty within the 17 UN Goals. Horst Teltschik, a former advisor of Germany’s Chancellor Helmut Kohl, advocates the good relations between Germany and Russia that resulted in the German reunification. Teltschik is a Member of Board of the Basel Institute of Commons and Economics since 2015 yet. The Institute is proud that Teltschik’s new book „Russian Roulette“ will appear on March 21st. Now Germany’s SPIEGEL in the print version published an interview with Mr. Teltschik that we offer for download here. Unfortunately the interview is not available in public and open access. We hope that SPIEGEL will continue to consider our work nevertheless – and to promoting peace and reconciliation with our honourable neighbor, that suffered so much on the hostility of its neighbors in World War II. Stephano is a Field Officer of the National Networks of Farmers Groups in Tanzania for the Kilimanjaro region. There are around 400 African languages in Africa to consider. All of them represent local Social Capital. The World Social Capital Monitor should offer all of them. Unfortunately the German ODA is focussed on exporting frozen Dr. Oetker Pizza to Kenya. Maybe the release of the first Africa Social Capital Monitor will a bit change the focus. In the meanwhile, a new Index entered our Global Index Benchmark, the so-called SDG Index of the German Bertelsmann Foundation. Therefore we were capable to update our Global Index Benchmark in December 2018 and here you can download the Excel. You may quickly think: this is for experts only. Unfortunately, this is true. So when we send the results to Ministries for Development or to Development Agencies they don’t know to read it and never consider the results of course. But there may be political reasons as well: the results of the Global Index Benchmark are questioning the entire database of the Official Development Assistance (ODA) as well as the financial instruments of the UN, the IMF, the World Bank, and the Development Banks. We can demonstrate this with three charts. Since decades the same 20 countries lead all Global indices. But whom does that help? 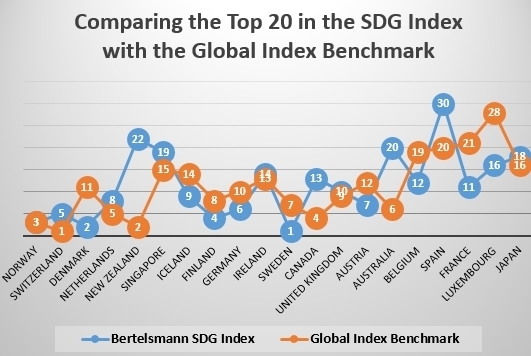 On the first chart (see image left) we see a comparison of the Top-20-countries in the Global Index Benchmark of 10 indices with their ranking in the Bertelsmann SDG Index. While the SDG Index is composed of the same indicators the other indices use – GDP, life expectancy, education time, digitalization, health – the difference is very small – especially when we know, that 151 countries are considered in the Global Index Benchmark. Smaller controversies in the joint scores of the indices can only be found in the cases of Australia, New Zealand and Luxembourg, that are blamed for less ecological compliance by the Happy Planet Index, that ranked e.g. Australia at rank 105 only. We may consider as well: all the countries are OECD countries and ten of them are small countries with a population of fewer than 10 million inhabitants. And 15 of them are direct neighbors at the northern hemisphere. When we make the case of these findings we often hear that that’s exactly what the task of the indices and their rankings is, which is to provide the best practice for the emerging and developing countries who are the pupils in the World’s school of development. But even in school, we need common standards to assess the performance of the pupils. Do the indices provide a common standard? In statistics, we can assess the existence of a common standard by the mean average deviation of the scores of the ten indices. Will they agree in the same extent on the winners as well on the losers? As we can see in the chart (image on the right) the average deviation to nominate the ten winners of all Global assessments is 9.75. That means: among 151 countries we include, the difference in identifying the Top-ten-countries is only 10 ranks. By looking at the chart we may as well recognize the fact, that there is only one country with a bigger population among the top ten. We may summarize: ‚The smaller, the better‘, which gives place to explain the societal and economic success of smaller countries by social cohesion, shared social values and perceptions and of course a high level of non-material assets such as interpersonal trust, helpfulness and the willingness to co-finance the public goods. The crucial question is now: do the experts from UN, WEF, Transparency International, World Bank, IMF, and other IGOs assess the countries at the end of the ranking with the same deviation? 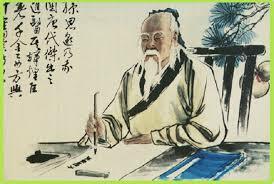 If yes, we may criticize the outcome but had to consider nevertheless certain objectivity and rationalism in the scores. So we look at the last ten ranks of the Global Index Benchmark (image left). 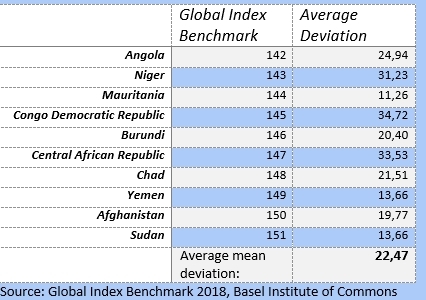 While there are nevertheless three countries still with an affordable mean average deviation (Mauritania, Sudan, and Yemen), the average more than doubles now from 9.75 ranks to a deviation of 22.47 ranks! So the experts agree more whom to praise then whom to blame. While the experts, of course, come from countries among the top-twenty, we may consider: the Global indices favor a few OECD countries where they come from. Only with this knowledge, you can explain why the Russian Federation (92) ranks three places behind! Ukraine (89), or why Turkey (81) ranks behind South Africa (77), or Brazil (62). It’s time to throw the old indices overboard and to start assessing countries by assets they have on their own and that they can, therefore, improve by themselves. When the 17 United Nations Sustainable Development Goals (UN SDGs) have been launched in 2015, most of the amazed supporting donor countries from the OECD believed that the Goals were about increasing a bit their Official Development Assistance (ODA) – and as well the capital for the Development Banks. Even a UN Sustainable Development Fund has been launched – with the disruptive size of $ 70 million (not bn!) when we created the chart presented here in early 2018. For quite a lot rich countries to financing the Global SDGs isn’t any issue. They regard the 17 UN Goals as something to implement in their National politics and started initiatives to meeting the SDGs in their country such as our own country Switzerland. And so the rich countries go to protecting their biodiversity and clean water, claim Gender justice and support campaigns to avoiding waste. In Switzerland of course. How comes? 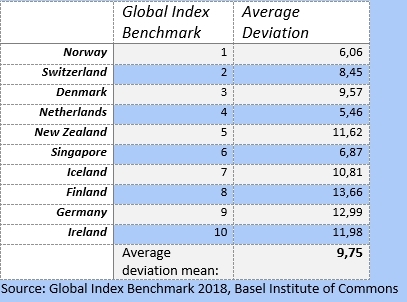 Well, the Bertelsmann Index creators used indicators that all depend entirely on GDP, as we can see in the Global Index Benchmark, that compares the rankings of countries in the SDG Index with their ranking by GDP. In late 2017 the United Nations started the Inter Agency Task Force (IATF) on Financing for Development, an initiative to improve both the knowledge as well as the funding of Development in general, of the 17 SDGs in special. This is quite funny, because with public expenditures of $ 790 billion per year for military, the United States are the biggest governmental spender in the economy worldwide. It’s also funny that Mrs. Amadeo refers to ‚international law‘. As far as we can say in October 2018, none of any of the international laws is respected by the United States of America. But the document shows, how difficult it is for the IATF on Financing for Development to release any position featuring the size, the sources and of course the governance to implementing the Finance for Development. So we – the Basel Institute is part of the Civil Society activities within the IATF on Financing for Development see: https://developmentfinance.un.org/iatf-2018-report-preparatory-materials – have to find ways to creating a decision base on Financing for Development. It’s a bit like with the Global HFCs case that has been successfully resolved in the Montreal Protocol in 1987: we may know from experts what do to, but doing it is a different thing. By chance in the HFC case it happened and even the US and China abolished the HFCs. So here we get a first overview on the estimated annual costs. The general costs in any case start at $ 2.5 trillion per year (UNCTAD). That sounds a lot, but is e.g. the GDP of Germany only. Due to the interlinkages, the single SDGs are hard to estimate. The World Bank’s study on achieving clean water all over the World (SDG 6) claims $ 150 billion per year needed. That’s not a lot when we compare it with transaction costs such as the $ 1.69 trillion for military according to Stockholm’s SIPRI. To overcoming poverty (SDG 1) may be resolved by a basic income for the remaining 600 million really poor, that the Basel Institute calculated wit 132 billion Dollars per year. That means: 220 Dollar per head and year. A similar approach has been taken by the WHO: they estimated $ 58 per head and year to achieving SDG 3 (Health and Well-Being). If we take a target group of two billion people in need of this help, we reach $ 1.16 trillion per year. The most surprising figure here – even and especially for experts – may be the 10.5 trillion new debt per year the OECD countries pick up. This figure appears when we divide the total debt of $ 63 billion by a maturity of six years. Of course neither the OECD, nor the countries, nor World Bank and IMF feature this reality of raising sovereign debt year by year (Rank 1). Nevertheless the OECD considers what they call ’new debt‘, which is only the increase of the total debt (Rank 3). As well rank four rarely appears in official statistics: the $ 429 billion expats send to their families in developing countries every year. The ODA, that still is regarded as the major source to achieving the SDGs, is only 1.4 per cent of the new sovereign debt. The Development Banks as well deliver quite few to the 17 Goals – especially when we consider their focus on big infrastructure projects such as roads, harbors and airports, that may create transaction costs for pollution, interests and security, that are at the same size than the investment. When it comes to the NGOs, that drive the public picture of Financing Development through images of poor children in rural areas, we see how small their contribution is. The Bill and Melinda Gates Foundation accounts for $ 4bn a year, but how much of this money goes to vaccination and pharmaceutic products, consultancy and marketing for vaccination programs? The poorest source to Financing for Development unfortunately is the UN Sustainable Development Fund with $ 70 million ‚invested‘ the end of 2017. So what is Basel Institute doing to better the situation then instead of complaining? As you can read in the article of Germany’s Handelsblatt, Basel Institute has talked to quite a lot institutional investors that currently do not allocate in any of the countries in need. As a result we started to developing a $ 10 billion fund that invests in the SDGs. The knowledge base comes from our worldwide Social Capital Assessment, that for the first time assesses the three indicators on co-financing public goods and to investing in local small enterprises and cooperatives. So the fund will focus on these three indicators and provide capital at a very low interest rate, that allows local companies and cooperatives to invest in a mid-term perspective. Which obstacles do we have to overcome if we’d like to directly fund on the SDGs? 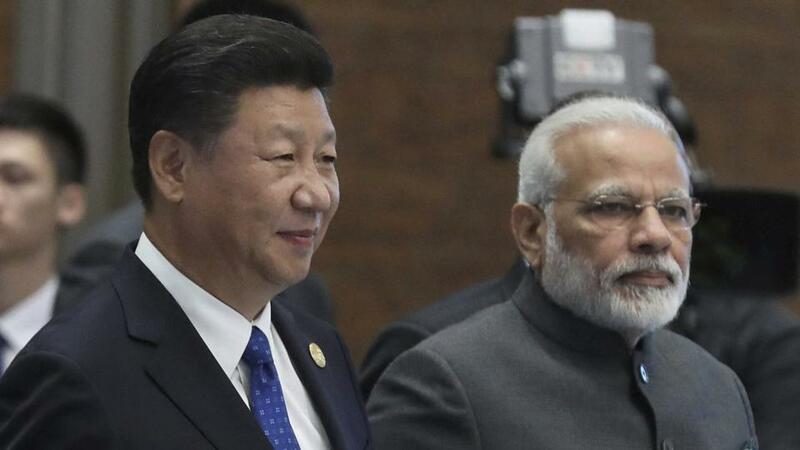 Development Banks fear to losing the political control they implement with their projects through bilateral and multilateral agreements on e.g. ‚free trade‘, ‚governance‘ and ‚rule of law‘. Further they have to follow the political agenda of their owner countries that will not consider the SDGs 1, 10 and 16. Development ministries delegate Financing for Development to their collaborating Development Banks and the NGOs that execute the local projects. Some of the SDGs – especially SDG 1, 10 and 16 – are not in their agenda or a regarded as a duty for ‚private‘ actors. So they launch conferences on PPP for Financing Development instead of dramatically increasing their own budget. UN agencies fear the review and assessment of their small funds and of course a confrontation with the major donors of the UN which are the OECD countries, that are called to sharing their access to capital. Governments fear to losing the political control that is connected with ODA and Development Credits while the projects have to apply for funding at governmental agencies. So Basel Institute will provide the figures for the three new indicators in the beginning of 2019, continue to fundraising the SDGs Social Capital Fund and of course to contribute to the IATF on Financing for Development. Beside the fact that there is serious doubt that the event happened – if the governments of the US, the UK and France had evidence for the existence of a ‚clandestine chemical weapons arsenal‘ to attacking these arsenals with missiles may cause thousands of deaths and an environmental disaster. The Basel Institute of Commons and Economics. a member of the UN stakeholdership to achieving the common UN Goals – especially Goal 16 Peace – therefore released information from the ground in Douma that raise questions on the chemical weapons attack. Further the Basel Institute condemned the assault on Syria, that since seven years now suffers from a proxy war causing millions of refugees and around 700’000 death up to now. Attacking this country again without considering the Charta of the United Nations weakens the bodies of the UN such as the Security Council, the General Assembly, OHCHR but as well UNDESA and UNESCO that work for peaceful relations and solidarity between the countries. The release of the Basel Institute has been published by the Austrian News Agency APA in the context of the UN’s activity concerning the alleged attack with chemical weapons and appeared in Austria’s ORF on April 22nd 2019. The Basel Institute of Commons calls to all governments and Civil Society to supporting the bodies of the United Nations. 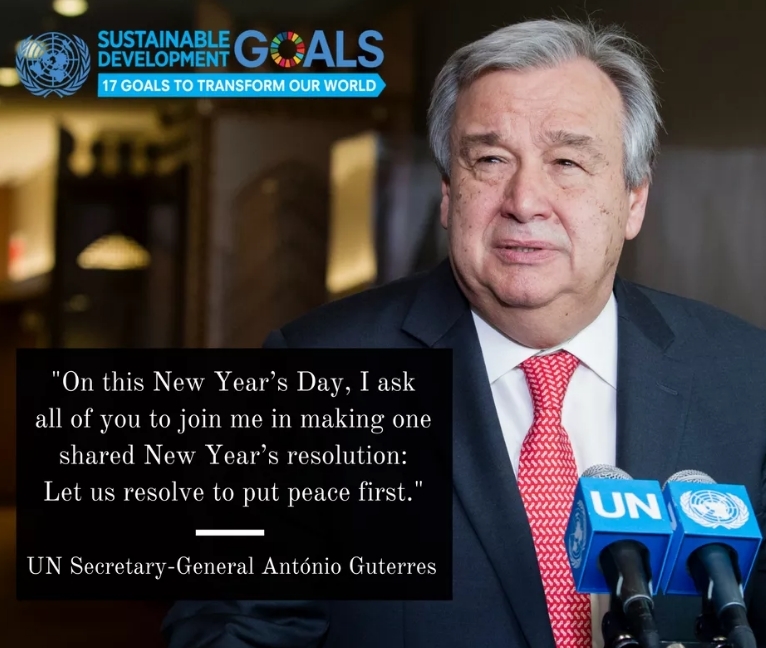 Only respect for the community of the United Nations and its General Secretary António Guterres can prevent further violations in the future. Imagine a group of people discussing and agreeing on 17 common goals. In general they will sort of voting on the goals with the most support across the group. So their goals are in fact a chart on what they favor. But one thing they never do is to thinking on the dependencies and interactions between the goals. You can see that in every local administration budget where measures and limits on spending are confronted with the projects they want to fund. One of the two doesn’t fit at the end. Goals collide. 1) Choosing Global Goals that a government or an organization can easily meet and achieve without any extra intellectual, political or financial efforts, e.g. of course the crops industry feels to ‚fighting hunger‘ (Goal 2). Rich OECD countries implement compliance and governance to achieving goals 3, 4, 5, 6, 7, 13, 14 and 15. 2) Choosing Global Goals were you can attend funding from donors. This choice quickly leads to a couple of goals such as 3, 4, 5, 6, 7, 11, 12, 13, 14 and 15. As we can see, both motivations lead to the choice of the same goals. But unfortunately the 17 Global Goals as well have an interaction between them. ‚Zero Hunger‘ (Goal 2) is even a goal that requires to eliminating poverty (Goal 1) and social inequality (Goal 10) before and as well to achieving peace (Goal 16) of course. On top Goal 17 is about financing all the Global Goals. To achieving any of them without any extra funding is out of reach. 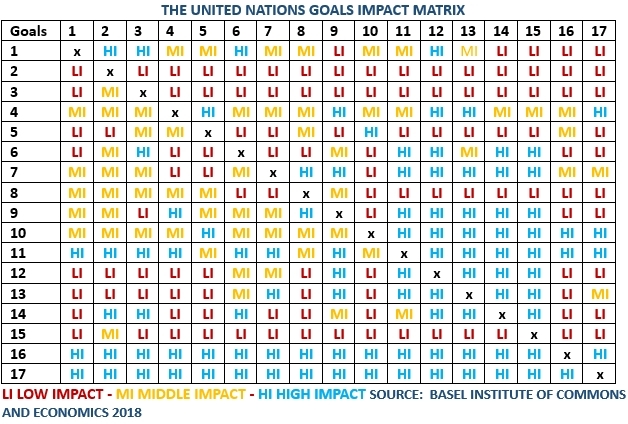 To better understanding these interactions we created the first UN Goals Impact Matrix, that you can download here. Even if you won’t share all of the estimates lying behind this matrix you will being inspired by playing a bit with it. We therefore provide a MS Word version here so that you fill it out by yourself. The paradox thing is, that the Global Goals with the highest impact are the ones with the lowest support. So the funding and support moves to the low impact, which we explained before by the motivation. So how can we create any motivation to considering Goals 10, 11, 16 and 17 as well? If we don’t, the Global Goals will fail. 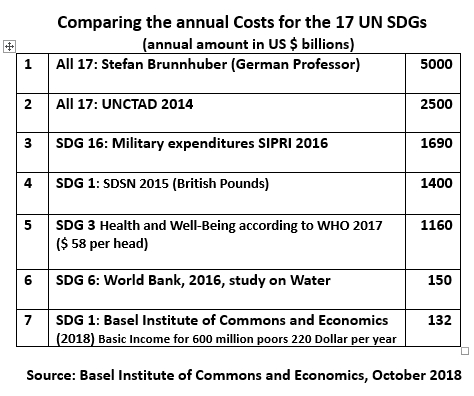 Within the United Nations activities to Financing Development the Basel Institute of Commons and Economics recently provided a calculation of transactions costs such as credit/debt and expenditures on alleged ‚defence‘. On the occasion of the Munich Security Conference 2018, that in the Munich Security Report 2018 again pretends a ‚decline‘ of military costs within the NATO, the Basel Institute released a first ranking of 146 countries by their Export-Defence-Ratio (please click to download). Surprisingly we find six NATO member countries among the countries with the best ratio (see table). These six NATO countries are in charge of only 1.33 per cent of the estimated $ 1.5 trillion NATO spendings on alleged ‚defence‘ every year. So in our view to achieving the common UN Goals of the 193 countries that agreed to them in 2015 to reducing the transaction costs for both capital and military opens space to financing the World’s public goods. These $ 1.5 trillion include not only the official NATO expenditures but as well the expenditures and the damage NATO causes in other countries such as first in Russia and China, but as well in DPR Korea, Iran, Venezuela, Cuba, Ukraine, Donbass, European Union, Afghanistan, Pakistan and many more. Of course this calculation may encourage as well NATO members to considering their transaction costs. To transforming NATO into a diplomatic civil initiative might be the thing to do 73 years after World War II and 27! years after the abolition of the Warszaw Treaty. Basel Institute will advocate this proposal on the Munich Security Conference 2018.
Financing Development: Where is the Market Price for Peace? While most of the countries and their statistical offices still believe that the 17 UN Goals are an audit for the year 2030 only – and therefore enhance their capacity building to delivering their right figures – the single Goals such as Goal 1 (Overcoming poverty), 13 (Stopping Global Warming) or Goal 16 (Peace) according to the estimates need funding up to $ 5tn per year. 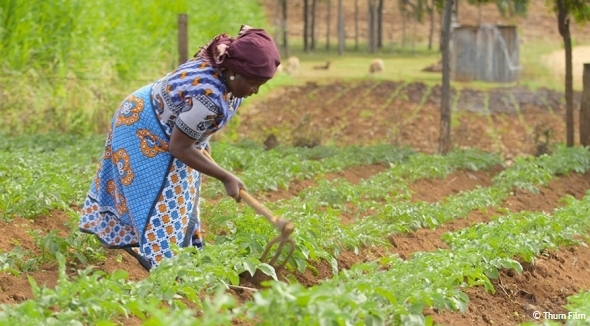 The recently launched UN Inter Agency Task Force (IATF) on Financing Development now published a first report for 2018 – including the figures presented by the Basel Institute of Commons and Economics: https://developmentfinance.un.org/iatf-2018-report . 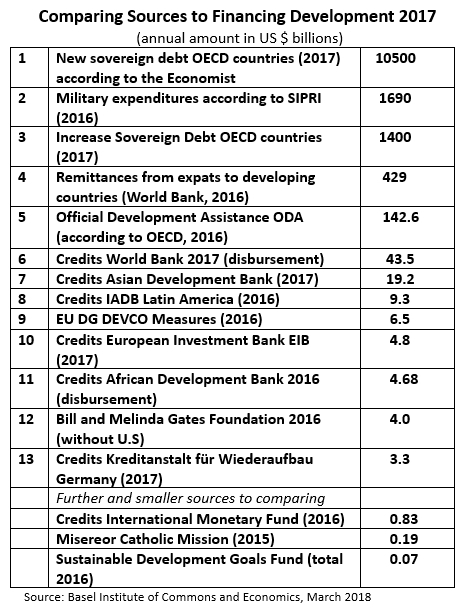 While reading the figures we learn that the annual World development assistance is around $ 140bn per year and the World Bank reaches out credits of $ 47bn. But unfortunately only the OECD countries raise new sovereign debt at the size of $ 14tn per year. According to the Swedish SIPRI, the military expenses reached $ 1.69tn in 2016. The good thing is: both, the military expenses as well as the sovereign debt is money controlled and raised by the governments. Governmental money is a public good. So if the governments had the will to reaching some of the more expensive SDGs such as 1, 13 and 16, they have the opportunity to shift their allocation: instead of dedicating public money to defense, weapons, war and conflict ($ 1.69tn per year) they may investing in peace. Instead of providing zero-interest-credits only to financing their own debt ($ 14tn per year), they may starting to provide zo-interest-credits to the regions of conflict and crises where they are hardly needed to rebuilding the countries such as in the Middle East, in Ukraine, in Afghanistan and Pakistan. in Brazil, Mexico and Venezuela and of course in almost the entire Africa. If we had a market price for peace: why not expecting governmental and private investors to paying it? The peace bond is not on the market yet. After World War II many European regions have been entirely damaged. It took only ten years – from 1948 to 1958 – to establishing common prosperity by peace in most of the European countries. That peace lasted up to our year, the year 2018. Now we have to repeating this success story for countries and regions still in conflict. Kommentare deaktiviert für Financing Development: Where is the Market Price for Peace?